Sasha Trudeau knows all about working beneath the shadows, back-alley deals, and things that go bump in the night. She also knows that the world is unaware of the existence of the paranormal - and that the government would like to keep it that way. Bad Blood is the first book in a new paranormal series called the Crimson Moon from L.A. Banks. It seems to be styled in the vein of a covert ops military thriller. A team of soldiers with supernatural abilities (in this case werewolves) protects the unwary public and nation from the preternatural monsters. Or is it about weaponizing supernatural abilities in humans to fight all enemies supernatural and foreign. Pages and pages of info dumps about the state of supernatural affairs, creatures and politics left me dizzy and confused. We don’t actually get to see a fully functioning team go on a mission together and the two minor missions described yield little except an excuse to garner some information for Sasha which she subsequently learns elsewhere anyway, and for her to be introduced some characters that she could have met anywhere without the pretense. The rest of her team goes on a separate mission ultimately resulting in the disbanding/demise of the team. We learn that the team members don’t fully understand what they are although their superiors do. The why is part of the story but still confusing and unnecessarily convoluted. In order to solve these and other mysteries Sasha sets up a shadow team, unknown to her bosses, to investigate. Maybe subsequent books in the series will involve the covert ops shadow team. But then why spend all the time setting up the one in this novel and then dissolving it? Overall way too much info dumping and back storying (is that even a word?). The story would have benefited from smoother integration of the details (or spread across more novels-why reveal everything at once) as well as showing through action or scenes some of the events rather then by just talking about them. For the most part it seemed rushed and unpolished. However there are some absolutely wonderful scenes that had me saying out loud “why couldn’t the rest of the book have been like this?” These scenes revolve around Sasha’s discovery that she is a special breed of werewolf called a shadow wolf. Shadow wolves have particular abilities and skills called shadow dancing (sounds corny but it really isn’t when you read it). The sequences where this is revealed to her by her soon to become paramour Max Hunter are a sheer joy. Exuberant and delightful, the passages jump off the page. Obviously Banks cares very much about this aspect of her world and characters and the book is almost recommended for these alone despite the other flaws. Let’s hope there is greater focus on this in the next volume called Bite the Bullet which arrives in October. Perhaps wait to see what the reviews are like for the next book before diving into this new series. It has potential, but there is just too much crammed in too quickly in this first installment. Visit the Crimson Moon website. 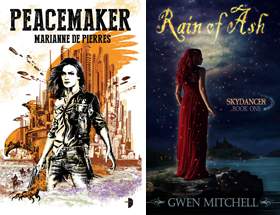 Fans of paranormal spy/military thrillers might enjoy Savannah Russe’s Darkwing Chronicles or Jennifer Rardin’s Jaz Parks series while you wait. I think the series as a whole could really have benefitted from readers being able to see the pre-dissolution of the original team. I agree that having all this stuff spread over a couple of novels before hand would have really done much better than cramming everything into one first novel. You mention the beauty of some of the scnes, as if Banks had more love for those parts of the story, and I think that actually contributed to my lack of interest... It's as if she wanted to rush so quickly to those parts that she skimmed over everything else. I am reading the sequel now and it has a steadier pace although I still find some of her action scenes confusing. Could just be me.